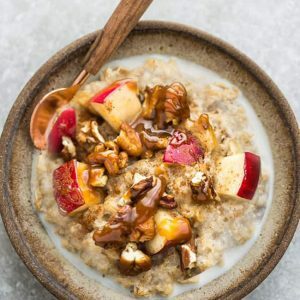 Apple Cinnamon Steel Cut Oats – an easy make-ahead breakfast perfect for fall. Made with gluten free oats, warm spices, apples and maple syrup. Best of all, includes instructions for the Instant Pot pressure cooker & the stove. Add oats into the Instant Pot followed by liquid. Stir in apples and cinnamon. After the pressure releases, open the lid and give the oatmeal a good stir. Any extra liquid will absorb as it cools. Stir in the sweetener. Divide into bowls and top each with more apples, pecans, almond butter and milk, if desired. Stir in apples, cinnamon, maple syrup and add-ins of your choice.